Phoenix Furlong is the third child of Chance and Celine Furlong. This time, it’s a son. He’s my created character along with Edwin, Jake’s other son. After an afternoon of patrol, Flight Colonel Chance landed his jet at the Enforcer Headquarters. His buddy, Jake, who was now the instructor for shooting and gadgetry, rode with him. As they got out of the cockpit, Felicia and Brandon got out of their jet. “Nice flying, Chance. Or would T-Bone be okay?” Jake asked. “Oh, call me by my name. We’re high ranking in the Radical Force with two commanders we can trust,” Chance answered. “I’m glad too. And, how’s our son’s shooting progressing?” Jake asked. “He’s mastering your skills like a pro,” Felicia said, rubbing Brandon’s head. “Perhaps you can fly with me sometime, little pal,” Chance said, softly shaking Brandon’s chin. “I’d love that,” Brandon began. “I think you’d better master flying with your mother first before I let you go flying with my partner,” Jake said. “It’s okay, Jake. I can calm down on my maneuvers for him,” Chance replied. Then, Phoenix came to the runway to meet his father. “Hey, pops. When are you going to give me those flying lessons you promised me?” he asked. Chance led his son downstairs. Phoenix looked back and waved good bye to Brandon. Brandon waved back and looked at his dad. “He’ll make it soon or later. I wonder how the Furlong sisters and Ferrando are making out?” Felicia asked. “Ferrando is progressing well, I think. Man, I really miss him,” Brandon said. At the shore, Ferrando and Tipo, who was the Captain of the Coastal Patrol, finished their afternoon patrol together. It was an occupation that Ferrando liked well, and he himself was given a miniature trident created by his father. “Do you feel like you’re mastering the art of coastal warfare, son?” Tipo asked him. “I like this traditional trade. Like father, like son. And, thanks for making this little weapon for me. It’s a treasure,” Ferrando answered. Then the Furlong sisters, who were two of Felina’s on-ground Enforcers came and sneaked behind Ferrando. Tracey snatched his trident and Ferrando turned around. “Hey, could you give that back, please?” he asked. “Try and get it first, sucker,” Tracey teased, waving it around him. Stacey tapped her sister on the shoulder. “Come on, sis. Stop being a wise she-kat and give Ferrando his weapon back,” she said. “Fine,” Tracey groaned and put it back in Ferrando’s paw. “Why did you do that anyway?” he asked. “I just wanted try practicing my snatching skills for in a fight against criminals. I never meant to steal it from you, buddy,” Tracey said. “As long as he graduates next year. If our little brother thinks more of flying than of his studies, he’ll miss his chance,” Stacey laughed. “Why are you laughing? It’s not funny to him,” Ferrando said. “Oh, I know. I hate to tease him,” Stacey replied. “We just hope that he’ll make it into the Enforcers with a decent education,” Tracey added. Celine came by and walked over to her daughters. “Are you ladies making fun of your brother again?” she asked. “No mother. We want him in the Enforcers with the rest of the family. It’s like an Enforcer family tree we’re all in,” Tracey said. Celine smiled and softly smacked Tracey on the cheek. “I’m glad to hear that at least,” she said. Meanwhile, Phoenix was in the Megakat Library with his tutor and two friends. Phoenix became bored with his essay structure and started talking to his friends about his future career in the Enforcers. “I think my flying education next year will be more interesting than this history crud,” he said. His friends nodded their heads. “I hear you. Are you going to be a pilot?” one of them asked. “Yeah, and why are you so anxious to join the Enforcers?” the other asked. “What about the risks and the danger involved?” asked the first friend. The two friends liked his way of thinking, but his tutor became annoyed. She did not want him to let his ambition get in the way of his studies. “Phoenix, do stop talking foolishness and get on with your essay,” she pleaded. “Oh, don’t sweat him. He’s really looking forward to next year,” the second friend replied to defend Phoenix. “Let’s finish our essays, please.” Phoenix decided to save the subject for when his essay was done. 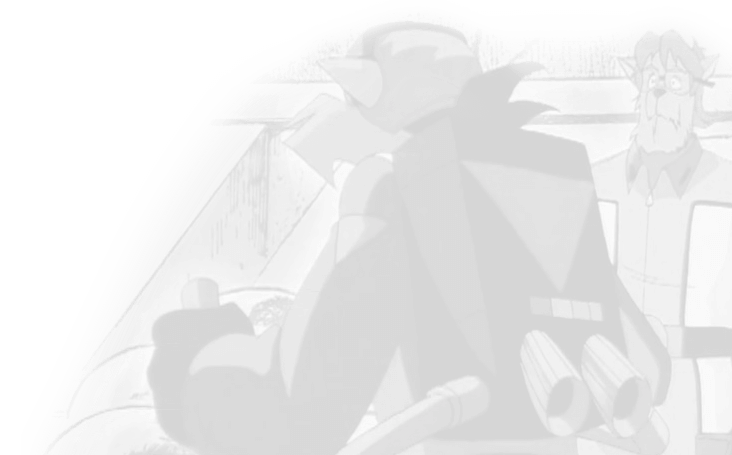 At a base on Ana Kata Island, a terrorist named Juan and his sidekick Tikie were getting ready to invade Megakat City. The Ana Kata Island government wanted to break off being owned by Megakat City and become its own power. Juan wanted the same thing. “Megakat City is as good as a wasteland when we get through. When we level that city, it will ours for the taking,” Juan said wickedly. “But, what about the Enforcers, Juan? Did you consider the variable size of the Enforcer units?” Tikie asked him. Juan set fire to two pictures of Felina and Roland and flung the ashes into the air. “I guess that is what you wish for them if they should lose their lives,” Tikie assumed. Two weeks later on a Friday morning, David was in the Headquarters classroom, finishing a test. He had to answer 100 questions, but miss only six to still pass. “This is strange! The enlisted never had to take a written test before training,” he complained. The history questions were easy, but the technical questions were a bit hard. But, most of it was multiple choice, and David finished it in an hour. Roland came into the classroom. “Are you almost done?” he asked. “Oh, call me Commander Roland. I don’t want other Enforcers mistaking me for my uncle,” he laughed, taking the test from David. He observed it carefully. “Well, it looks like you missed only five. Tipo will see you on Monday at ten,” Roland said, shaking David’s paw. David walked out and, at the door, Tipo and Ferrando were waiting for him. “Greetings. Did you pass?” Tipo asked. “Yes, and this is my son, Ferrando,” Tipo explained. Ferrando and David shook paws. “Yes. My father thought it was time that I started working with other rookies and said you would be the first,” Ferrando stated. “No, I’m grateful that you’re joining us. I’ve also heard that you’ve been a great fan of mine for a long time. Welcome,” Tipo said. “I’d better go now. If you have time, Ferrando, can you walk with me?” David asked. As David and Ferrando walked out, Felina walked in after her flight patrol duty. “Have a nice patrol, dear?” Tipo asked, kissing his wife on the forehead. Felina chuckled. “Don’t start here, buster. I did. It feels good to be back in the air after much time on ground. So, is your new trainee ready?” she asked. “Yes. He and our son are out on a walk. He’ll be back in one hour. And, how are Tracey and Stacey coming along?” Tipo asked in return. David and Ferrando walked to a diner, where Brandon, Tracey, and Stacey, Chance, Jake and his other son Edwin were. They all ordered fish and bread. Brandon and Ferrando hugged when they saw each other. “Good to see you, Ferrando. How are things on the ocean?” Brandon asked him. “Who said you could join us? Go sit somewhere else,” Tracey teased Ferrando. Chance patted her on the back. “Cool it, honey. We’re Enforcers, we’re all family,” he said. “That’s Colonel Furlong to you, blockhead,” Stacey said, pointing her finger at Ferrando. David stepped in. “Step off, smartie! He’s my friend,” David told Stacey. David nodded. “That’s good to hear. Because we will need more enlisted men with the Ana Kata Island invaders,” Jake explained. “Yeah. I would not want to spend another vacation there anymore,” Chance added. “Me neither. Ana Kata Island’s become dangerous with its armed forces. We have been watching out for enemies from that place,” Jake went on. David’s attention was turned to a young, pretty she-kat named Jennifer. He walked over to her. “Jennifer Clawson. And, you must be David Noble,” she responded. “How does she know his name?” Ferrando asked Jake. “Over e-mail. They send each other gifts,” Brandon said. “Sweet. I’d love to see them kissing,” Tracey joked. “Knock it off,” Brandon snapped, making her nervous. “It’s a pleasure to see you in person,” David said, shaking her paw. Suddenly, one hard-looking tomkat pushed David off and sat next to Jennifer. “You look so fine. Want to dance?” he asked. “No thanks,” she replied, pushing him aside. He became insistent and David firmly tapped him on the shoulder. He turned and shoved David off. “You be off!” he snapped. Jennifer got mad and elbowed him in the chin and kicked him in the groin. “You want more? Step off, I said!” she screamed. He regained himself and left. Jake walked over to his sister. “Okay sister, that’s enough,” he said. “You too, sister. And, this must be a new friend,” Jake added, patting David on the shoulder. Later that evening, David and Jennifer took a walk around the park. “You know, I’m glad your brother isn’t making a big fuss about me hanging out with you,” David said. “I’m glad too. He’s been a bit too protective of me when I first joined the Enforcers,” Jennifer replied. David and Jennifer stopped walking for a few minutes and looked into each other’s eyes. “I believe you had feelings for Chance once,” David mentioned. Jennifer was about to feel love awaken for the second time. She trusted David to be an honest tomkat and not to ever change. Then, her buzzer went off. “Damn! Well, we’ll talk later, David. I’d better go.” Jennifer hurried off, leaving David frustrated. “Must duty always stand in the way of love?” he complained and looked to the sky to see the pilots flying by. “David, get to a safe place now! We will take care of the situation,” Roland ordered. Chance led his unit to a big aircraft from Ana Kata Island. “Looks like you were right, buddy. Ana Kata Island’s force is turning to terrorism,” Chance said to Jake. “Yeah. Even if the mayor allows Ana Kata Island its freedom, it would still want to take over Megakat City,” Jake replied. “I know. It’s just hard to believe.” Chance called Roland. “Sir, shall I have my pilots circle the ship?” Chance asked. “Yes, but try to keep your distance. I’ll want to know what he wants first,” Roland replied. “Yes sir,” the Air Force replied to Chance and obeyed. “Jake, I guess it’s up to you to give the order on the type of missiles to fire,” Chance said. Roland and Chance gave Jake charge over the co-pilots who did the firing. Then, a hologram of Juan appeared. “Chance and Jake, have your men prepare for fire and shoot before the enemy tries to fire,” Roland ordered. “Yes sir! Flight Squadron, prepare to fire before they get in any sudden shots and pull in closer,” Chance ordered. Felina brought her ground Enforcers, including the Furlong sisters in a few choppers. “Roland, I’m going to go on board the ship to look for Juan,” Felina said. “All right, but be careful, sister,” Roland replied in a worried tone. Juan saw the pilots surrounding his ship and commanded his crew to ready the bombs. Chance and Jake saw the missiles being lowered. “Just as I expected. Attention, co-pilots! Lock on your slicer-missiles and fire!” Jake ordered. The crews obeyed and, as the missile were released from Juan’s ship, the Enforcer missiles sawed them in half, and they exploded within twenty feet of their jets. Some of the Enforcers were not so fortunate. As their jets shorted out, the crew punched out and used their parachutes. “Good job, Jake. But, we’re not out of the woods, yet!” Chance said. “How’s Brandon coming along?” Jake asked Felicia over the comm. “He made the hit just fine. I gave a bit of a pep talk to make his aim right,” Felicia answered. As the Ground Enforcers searched for the control room, a group of rebels charged at them. Felina used her bazooka, while the Furlong twins used their physical skills. Tracey seized an enemy’s rifle and hit him in the guts with it. Stacey had the gift of flipping over an enemy and kicking him in his back. She also elbowed some rebels in the ribs. Tracey had flung one enemy over, knocking over another. Juan watched the fighting from a distance and shot Tracey in the right arm. “Commander Marino, Stacey!” she screamed. Stacey ran over to help her sister and helped her over to the door. She called her father. Chance flew over the entrance. Jake and Stacey helped Tracey into the cockpit. “Stay here, sis. You’re going to be okay,” Stacey said. “But I?” Tracey began as she tried to get up. Chance gently pushed her back down. “No buts. Stay here with us. We’re going to get you to a doctor,” he said, pointing his finger at her. Meanwhile, Felina started to look for Juan. “Here I am, ladies. Sorry to not be there,” Juan said. “Freeze, Juan! You’re under arrest!” Felina said. “I don’t think so.” He jumped in front of them. Felina dodged his blows and seized him by the left arm and pinned him down. “So sorry you’re team is so weak,” she said sarcastically. Stacey was about ready to cuff him. A rebel grabbed her by the arm and wrenched them out of her paws. Stacey’s eyes widened. “Watch who you’re calling “little miss”! She jumped on his chest and she grabbed the cuffs back. Then, her victim pushed Felina off Juan, who stealthily hopped into a jet and took off. Felina took out her trusty old whip and tripped the enemy and cuffed him up. “There’s one down. But, that crazy fool got away!” Stacey complained. “I hope she gets well soon,” Felina prayed. Stacey stood next to Tracey while she was undergoing the surgery. Meanwhile, Phoenix sneaked to the Headquarters runway and met up with Jennifer. “Hello, Phoenix. What are you doing here?” she asked. “But, I want to know how to operate a jet or at least look inside one. Please! It’s really important that I’m well prepared when I’m enlisted next year.” He clasped Jennifer’s hands and pressed. Then, Jennifer remembered something about Chance teaching her to fly without permission from Feral. But, she trusted this commander’s kindness and understanding. As Phoenix kept pleading, Jennifer was forced to give in. Jennifer took Phoenix by the arm and lifted him into her jet. Seeing so many controls and other gadgets amazed Phoenix. But, he was also very eager to learn then and there. Back at Ana Kata Island, Juan was in a conference with the President of the United Arms. “Sir, I apologize that I was the only one who got back. I was thinking of going back to Megakat City in separate jets. We could make Commanders Roland Feral and Felina Marino submit by means of multiple combat,” Juan suggested. Then, the televising screen flashed on and Roland spoke up. “You’d like to try messing with us again, Mr. President?” Roland demanded. “We just want our freedom. But, since Megakat City doesn’t want to negotiate, we’ve had to take the small matter into our paws,” the president said. “This island was their usual vacation place. Too bad, no one from Megakat City has been able to pacify the security without getting shot,” Juan said sarcastically. When Juan walked out of the conference room, Tikie was there to meet him. “I’d like to come with you this time, Juan. I plan to combat that Felina myself. You and the others may deal with Roland and the Enforcers. Just leave Felina to me,” she pleaded. Juan saw that she was really determined to have her wish. But, they fought side by side, and he didn’t think who would fight who really mattered as long as he would know they would be beaten. “Thank you, sir!” She saluted him and left. He looked at her going down. “She’s a strong fighter. And, I would not be able to win without her, but she deserves the chance to win some combats,” he admitted. David was given lessons on how to operate a sub and how to use the scanner. Tipo gave him an example on the screen with an animated image. “All right, David. Let’s see you lock on this giant Mosasour,” Tipo said. David tried to locate the X on the image, but the icon kept dancing around the approaching creature. David barely hit the mark on the image in the nick of time. The image exploded well enough, but Tipo wanted more improvement from David. After the practice was over, David met Brandon and Ferrando on the shore. “Hi, David. How’s the practice going?” Ferrando asked. “You don’t want to know. Lousy,” David replied. “That’s not a very positive attitude, David. I’m sure you could have succeeded better over the three weeks you’ve been trained,” Brandon added. “That’s encouraging,” David said in an annoyed tone. “You must be distracted or thinking on something else,” Ferrando wondered. “Is it about Jennifer Clawson?” Brandon asked. “No way. How do you know, Brandon?” David asked with an edge of disbelief in his voice. “He saw him and Jennifer meeting often by the Headquarters,” Ferrando answered. “Why would Brandon lie about it, my friend?” Ferrando put his paw on David’s shoulder. David brushed it off and walked away. Tipo walked over to the two kats. “What going on here, gentlemen?” he asked. “I think I’ve just said something I shouldn’t have,” Brandon said nervously. “I think David’s girlfriend is starting to slip a little,” Ferrando said. Then, the three tomkats became concerned for David and called Roland. Later in the day, David went up to the runway of Headquarters to meet Jennifer. He saw her helping Phoenix out of the jet. “I really enjoyed teaching you, Phoenix,” she said. “Thanks, but what if my dad or Roland saw you do this?” he asked in worry. Phoenix turned and became startled at the sight of an irate David standing just inches away from him. “Oh, is there anything wrong?” he asked. David tried to act polite. “Oh not at all. In fact, how rude I was to spoil this moment,” he said sarcastically. “David, listen to me? ?” Jennifer began. David put his paw up to her mouth. Jennifer scowled and walked off. Phoenix was about to leave, but David put his arm to bar his path. “Wait, David. You’re wrong!” Phoenix grabbed hold of David’s arm as he started to walk off. David seized his wrist and hurled him to the ground and went back on his way. Stacey knocked on her brother’s bedroom door. “Go away,” he said. Phoenix reluctantly let his sister in. She sat next him on his bed. “Looks like you’ve got a rival for Jennifer,” she cooed giving him a soft punch on the arm. He gave her an annoyed look. “That anger in his face didn’t look like he was kidding.” Phoenix sighed and turned his face from Stacey. As Stacey stroked his head and got up to leave, he called her back in. Meanwhile, David walked over to the diner where he first met Jennifer. And, there she was with Jake and Felicia. He felt remorse after receiving a warning from Roland. He slowly walked in, hoping not to be seen by any of the three. “You’ve been through so many relationship break-ups, Jennifer. It’s a real shame,” Felicia told Jennifer, putting her hand on hers. Jake saw David sitting all by himself. “He’s here right now. Would you like me to give him a sharp yelling at?” Jake asked. Then, Jennifer walked over to where David sat. The two lovers kissed while Jake and Felicia looked on. “I hope David Noble knows what he’s doing,” Jake said, a bit uneasy about him kissing her all of a sudden. “He’s fine, Jake. It’s a lover’s nature to express more with action than with words,” Felicia replied, kissing her husband on the mouth. “But, if he doesn’t know her very well?” Jake argued. After Phoenix had finished his junior year a week later, he was able to take flying lessons from his dad. One Saturday morning, David went back up to the runway on Headquarters to meet Phoenix and Roland. Chance smiled as he saw the two toms shaking paws. “Hope this young kat behaves himself from now on,” he said to Roland. “Glad to see those two Enforcers getting along,” Roland added. “Yeah. I was about to claw David alive that night, but I guess I won’t need to. I hope you weren’t too hard on David though. I must say he’s been a fervent admirer of me for three years,” Chance explained. David and Phoenix walked down to the gymnasium where RJ was wrestling Stacey. “Body slam!” RJ yelled in triumph as he pinned Stacey down on the mat. “Dogs and kats have never seemed to get along,” David said. “I wonder which one is the weakest. It’s never known to be the kat,” Phoenix added. RJ lightly showed his teeth. He got up and picked up David and Phoenix by their shirts. “Now, who’s the weakest?” RJ joked. “Put us down, RJ,” Phoenix chuckled. “Yes,” David said, feeling a little embarrassed. “Thanks. That’s all I wanted to know,” RJ said, stroking David’s head. “I should have told you two to watch out for him; he loves himself,” Stacey said. “Prepare for another body slam, Ms. Furlong,” RJ said. The Furlong siblings gave each other a high four. “We’ll be ready to show him; me in the sky and David at sea!” Phoenix said, wrapping his arm around David’s shoulder. “I think you two had better stick to your training. You’re not ready to fight yet,” Stacey said. Then, an announcement interrupted their conversation. “I’d better go! Later, you guys,” Stacey said as she ran off. “What does she think we are?” Phoenix asked. Then, RJ walked over to them and winked. “Get suited up. You have my trust,” he said. “Let’s get moving,” David said. As they got out, they saw the flight Enforcers over their heads with Roland and Felina leading. “One day, that’s going to be me leading them,” Phoenix told David. During the battle, Tikie started to chase Felina. “Commander Felina, watch out!” Chance yelled as he saw flashes of sparks and rays coming behind Felina on all sides. “You can’t get away, Commander Felina!” Tikie yelled, shooting at her. Felina’s jet was nicked a few times, but she went on fighting. She submerged under Tikie. “Try and catch me. I’m not trying to escape!” Felina fired back at her, hitting both of her wings. “Shoot!” Tike said as she used one of her ejecting exhausts to help her. “She looks determined. Perhaps this will ward her off,” Felina said as she let out a gout of exhaust, which blocked Tikie’s view. Tikie was able to get out of that cloud and started to look for Felina again. Chance and Jake were present and fired at her afterburners. She plummeted and Felicia caught her and delivered her to the Enforcers waiting below. Then, a group of enemy jets crowded around Chance and Felicia and started firing. “Crud! We’d better get these scum out of our tails!” Chance yelled. The enemy pilots followed their prey on opposite sides. Then, as Chance and Felicia spilt up again, the pilots realized they had been tricked. They tried to avoid crashing into each other. Their wings clashed against each other in their attempt to escape. Jake and Brandon caught the falling enemies in nets. Juan simulated Roland’s maneuvers, making it hard for him to get his aim steady. “Sounds like you’ve lost a few things,” Juan taunted. Roland locked on Juan’s afterburners and started shooting. Juan was able dodge those shots and fired at Roland. Roland’s fuel tanks exploded and he ejected, using a parachute. “Crud, Roland’s been hit!” Jake said. Suddenly, Jennifer appeared with Phoenix as her co-pilot. They were going after Juan. “Jennifer, don’t go there – it’s too dangerous,” Jake protested. “And, dad, I’m sorry, but you need my help,” Phoenix added. Then, they flew away. As they followed Jennifer, Felicia and the other Enforcers fought off the other two jets. Felicia and another pilot tried the same maneuver, but the enemy pilots did not fall for the same trick as their comrades did. Felicia and the other Enforcer swerved sideways as the two enemies submerged and began shooting. Not paying any attention of their coming together, they crashed and burned up in the accident. At sea, Tipo, Ferrando, and a crew of 25 prepared to fight the enemy sub. David was with them. “I don’t know how you convinced me to let you come,” Tipo told David. “I have ways of making people agree with me,” David replied. The enemy, who was called Perille, had a system that could collect data from Tipo’s sub. He laughed as he looked at his data screen. “Pretty soon, I’ll conduct a band of ocean crafts as great as this Captain’s,” he said wickedly. “He’s coming closer, father. Shall I fire now?” Ferrando asked. “Let’s wait until he fires first. I’ve never fired until the enemy attacked first,” Tipo answered. “Father, I’m sealing the sub. Shock waves approaching.” Ferrando and the crew sealed the submarine with a nuclear shield, and the waves returned to the enemy. “Well done. Let’s move in closer,” Tipo said. One of the other crewmembers checked the defense data in the ship’s program and found it was empty. “Captain, our weapon’s information is swiped off,” he announced. “Captain, the only way to do that is go on board the enemy sub and stop the villain himself,” David said. “No, David! You’re not ready yet,” Tipo said, holding him back. Ferrando joined David. “I’m going with him, father,” he said. Tipo was forced to agree. “Very well. Now, here are the directions. You and Ferrando go to the secret entrance located at the bottom as shown on the radar. Find the data room and record the stolen information and erase it from the system. Then, get out immediately! Understand? And, David, here’s another mini staff that I was saving for you. The two tom kats quickly got into swimming gear and swam over to the enemy sub. They found the conning and twisted the top open. Tipo made the sign of the cross on his heart. “God be with you two!” he said firmly. As Ferrando and David took off their aquatic gear, Ferrando took out a waterproof scanner and looked around for the computer room. “Any sight of our booty yet, Ferrando?” David asked. They entered the computer room and found the screen with the secrets on it. David quickly took out the disc and recorded the data on it. Finally, he sealed it and put it in his pocket. “Now to clean up.” As Ferrando was about to erase the program, Perille seized his paw and hurled him backward. David caught him and stopped him from falling. “Do I have uninvited guests?” Perille’s two submarine allies ran up to the two tom kats. Ferrando used his glowing staff and electrocuted one of the villains in the arm. David tried using his staff, but the other evil sidekicks grabbed it from him and threw it aside. David had to use his martial skills. He grabbed his opponent’s leg and tripped him. The attacker got up and started towards Ferrando. He kicked Ferrando in the stomach and held him down. David grabbed his mini staff and sent shock waves to blind the opponent. He covered his eyes and Ferrando was free. Perille grabbed David’s staff and clenched David by the neck. Then, he looked at Ferrando. Then, Ferrando had an idea. He pushed a button on his own staff that would flare up in the enemy’s paw. “Here. Before I go anywhere, take my staff too.” Ferrando tossed it to him. As Perille touched the instrument, it went off in sparks in his paw. He released David in his pain. David seized the moment and elbowed Perille to the ground. Then, taking his own staff, he shocked him one more time. Ferrando erased the information from the folder. “Thanks, Ferrando. I owe you one!” David said. The two tom kats put on their goggles and snorkels. Before they got out, Tipo, Roland, and a few Coastal Patrol Enforcers came down the conning tower. “Any problems, boys?” Roland asked. “No. I think David’s been prepared all along,” Ferrando said, patting David’s shoulder. David took out the disc and gave it to Tipo, who rubbed the back of his head. “I guess I mistrusted you, David. You’re one heck of a fighter.” Tipo gave David his paw to wrist shake. At the same time, Jennifer and Phoenix followed Juan as he elevated over the clouds. “We’re probably using one of Razor’s missiles,” Phoenix assumed. Juan turned widely to the right and went behind them. “Hope I’ve lost them. I’d better find Tikie,” Juan said. “Don’t hope yet!” Jennifer turned widely to the left and went back on Juan’s trail. “Those meddling pilots don’t seem to give up!” Juan said. He fired at them. “Crud!” Jennifer turned sideways to avoid the shots. She then ducked under Juan’s level of space. “Roger!” He repositioned the missile’s aim and fired. The missile followed Juan’s every move. “I can’t believe this!” he cried. He lowered his jet a little and turned about. But, before he knew it, the missile headed straight at him, coming from out of the blue. He tilted his jet sideways, and the missile hit fuel tanks. He ejected out of the exploding craft, and his parachute’s descent was caught by Jake. “Those two did it! My sister is one genius,” Jake said. “Yeah, but I wonder if my son was able to stop him as well,” Chance added. After Juan and Tikie were sent to the island prison for a bail of $50,000 from Ana Kata Island, Roland returned to Headquarters and saw Chance waiting there for him. “I tried looking for him myself. Look, I want to thank you for letting Jennifer work with my son. I should have used the leisure time I had to teach Phoenix a few things,” Chance said remorsefully. Then, Tracey appeared with Celine and visited her dad. “Tracey, sweetheart, what are you doing here?” Chance asked, lightly shaking her chin. “I think Phoenix has too much of his father in him. But, that’s okay,” Celine said, kissing her husband on the cheek. “Now, where could he have gone? If only he’d stop sneaking off so often,” Tracey complained. At the diner, David, Jennifer, and Phoenix sat having milk shakes. “Another battle won with new Enforcers,” David said. “Roger that!” Jennifer and Phoenix both said. “I’m just so relieved that Roland gave me that job of training you before our secret was out,” Jennifer commented. “And, you still have a lot to catch up on submarines,” Phoenix replied, getting back at David. “Boys, boys, it’s okay. You’re both new. But, David is going to make one heck of a coastal fighter, and Phoenix is going to make a swell pilot,” Jennifer complimented and kissed David on the mouth. “A kiss is a perfect ending,” Phoenix said sweetly. Then, he and David shook paws and finished their milkshakes. After that, the three kats went home. Phoenix became very proud of his pilot skills, and Jake finally, and reluctantly, allowed Brandon to fly with him. David eventually mastered the submarine with Ferrando’s constant support. 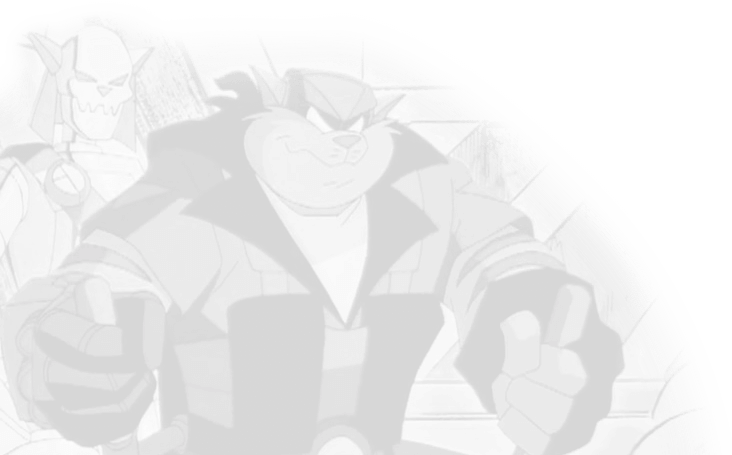 Tipo trusted David to fight alongside his son, and they became just as close partners as the original SWAT Kats. David and Jennifer’s relationship grew into true love that lasted forever. Phoenix and Brandon had as great a partnership and were called the New T-Bone and Razor by the young Enforcers. A short story of the madness that goes on behind the scenes of the Katseye News room. Also staring Clench Tighly, and the author.